Rabbi Mossei Aegypti Dux seu Director Dubitatium aut Perplexorum .... Paris, 1520, is a beautiful copy in its original binding of the first printing of the Guide [to the Perplexed] in Latin translation. The translation was not, as claimed, made by Agostino Giustiniani, Professor of Hebrew at the New College of Three Languages in Paris. 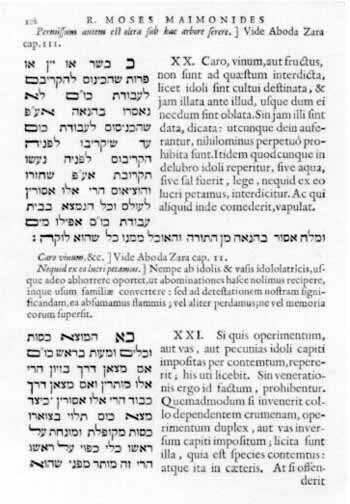 Jacob Mantino, an Italian Jewish physician and translator of Hebrew texts into Latin, is thought to have done this translation which Giustiniani merely corrected and edited. In any case, the translation is poor, superseded by the far more accurate one of Johannes Buxtorf Fil., Basle, 1629. The first edition of the Guide for the Perplexed in Latin printed in bold black type throughout. A historiated initial opens each paragraph in this historically important and typographically distinguished edition. 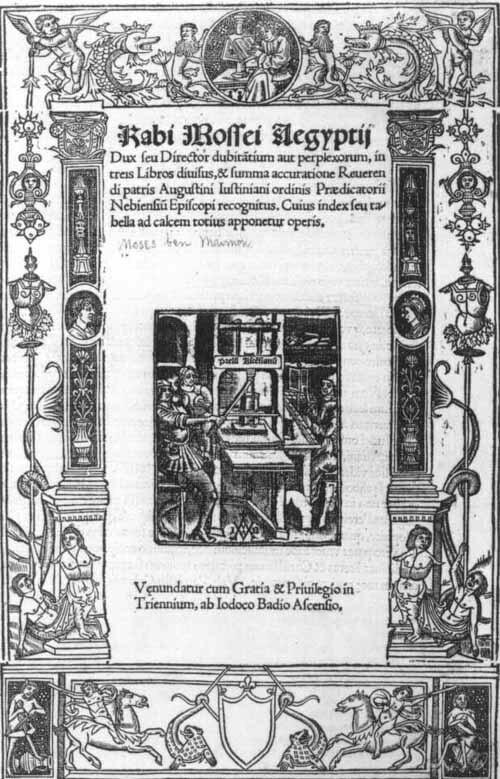 The translation, attributed to Jacob Mantino of Tortosa, was corrected and edited by Augustinus Justinianus. 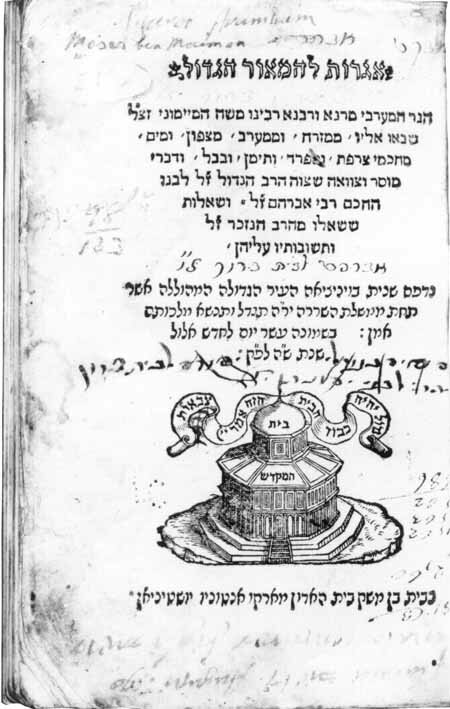 The quality of the edition is an indication of the esteem accorded the philosophy of Maimonides in the Christian world (Maimonides, Rabbi Mossei Aegypti, Dux seu Director Dubitatium aut Perplexorum (Guide for the Perplexed), Paris, 1520. Rare Book and Special Collections Division, Library of Congress Photo). Translations of portions of the Guide into Latin were made as early as the thirteenth century and were used by leading Christian theologians. Albertus Magnus (d. 1280) knew of "Rabbi Moyses" and accepted and used his interpretation of the book of Job as a philosophical treatise on divine providence. The greatest of Catholic theologians, Thomas Aquinas (1225-1274), was influenced by Maimonides, esteeming him for having harmonized biblical theology and Aristotelian philosophy. Duns Scotus (1266-1308) refers to Maimonides's discussion on the relation of reason and revelation, as well as his doctrine of divine attributes, and accepts his views of prophecy. It is not, therefore, surprising that the Latin translation appeared three decades before the Hebrew editions, except for the Rome edition, of which few copies were printed. Translations of sections of the Mishneh Torah into Latin and other languages are so many, that in the middle of the nineteenth century Julius Furst was able to list seventeen in Latin alone. Copies of many of these translations, as well as those in other languages, abound in the Library of Congress. We list one to represent the rest: Mosis Maimonidae, De Idolatria, Amsterdam, 1641, the fourth section of the first of the fourteen books of the Mishneh Torah, which contains laws dealing with idolatry. The translation and the accompanying commentary are by the Dutch divine, Dionysius Voss. It apparently attracted a considerable audience in each of the next two generations, for it was reprinted in 1666 and again in 1700. Christian scholars took great interest in the works of Maimonides. There are many editions of sections of his works, especially the Mishneh Torah, with Latin translation and commentary. One of the earliest is this edition of the section on laws pertaining to idolatry. The translator- commentator was Dionysius Voss. The publishers, the Blaeus, were of a family of noted publishers and cartographers (Moses Maimonides, De Idolatria (On Idolatry), Amsterdam, 1641. Hebraic Section, Library of Congress Photo). Though their titles differ, these two volumes are similar in content: T'shuvot Sh'elot V'Igrot ... (Responsa, Queries and Epistles ... ), Constantinople, c. 1517; and Igrot L'Ha-maor Ha-Gadol ... Rabeinu Moshe Hamaymoni (Epistles to the Great Luminary Our Master Moses Maimonides), Venice, 1545. You ask if you are allowed to say in blessings and prayers "God of our fathers ... You have chosen us ... You have brought us out of the land of Egypt." Yes, you may say all this ... Abraham our father, is the father of all proselytes who adopt Judaism. Do not consider your origin as inferior. While we are the descendants of Abraham, Isaac and Jacob, you derive from Him through whose word the world was created. When your teacher called you a fool ... he sinned grievously ... He should have been cautious not to lose his temper with a proselyte of righteousness ... A man who ... forsook his birthplace, his country and its power and attached himself to this lowly and despised people because he recognized the truth and righteousness of its Law . . . He who blessed Abraham will bless you and make you worthy of beholding Israel's promised consolation. As to your question about the nations, know that "the Lord desires the heart," and that the intention of the heart is the measure of all things. That is why our sages say, "The pious men among the Gentiles have a share in the world to come" (Sanhedrin 105a) ... Every man who ennobles his soul with excellent morality and wisdom based on the faith in God, certainly belongs to the men of the world to come. With regard to your request that I translate the text [of the Guide] into the holy tongue for you-I wish that I were young enough to be able to fulfill your wish concerning this and the other works which I have composed in the language of Ishmael [Arabic] ... I have not the time even to improve my works which I wrote in the rabbinic language [Hebrew] ... to say nothing of making translations from one language into another. But you have in your midst the learned Rabbi Samuel ben Judah [Ibn Tibbon] on whom the Lord has bestowed the necessary insight for performing the task you have asked of me. I have already written to him about it ... Honored friends ... You stand alone in raising the banner of Moses ... the study of the Torah in our communities has ceased ... In all of Palestine there are three or four places only; in the whole of Syria only a few in Aleppo ... In the Babylonian Diaspora only two or three groups in Yemen ... the Jews of India know nothing of the Torah ... what was inflicted upon the Jews of the Maghreb [North Africa] you know. Thus it remains for you alone to be the strong support of our Faith. Be firm and courageous for the sake of our people and our God; make up your minds to be brave men. Everything depends on you. Letters to the Great Luminary, the light of the West, our teacher and rabbi Moses Maimon, that came to him from the East, from the West, from the North and from the Sea (South), from the scholars of France, Spain, the Yemen and Babylonia. And ethical admonition and the ethical will which the Great Rabbi, of blessed memory, left to his son, Rabbi Abraham, of blessed memory. And queries sent to him and his responses. The printer's mark, the Temple in Jerusalem, is that of Marco Antonius Giustiniani. The legend above the Temple: "Great will be the glory of this house ... Saith the Lord of Hosts," is Giustiniani's hope and boast for his press (Maimonides, Igrot La-maor ha-Gadol, Venice, 1545. Hebraic Section, Library of Congress Photo). The Venice, 1545 edition was the third; the second was published in that city only a year earlier. Almost four hundred years after they were written the words of Maimonides still spoke to the hearts of so many that a new edition was published.